Tis’ the season to be jolly and the cruise lines are delivering an abundance of holiday cheer. Here’s what you can expect from sailings from late December until New Year’s. 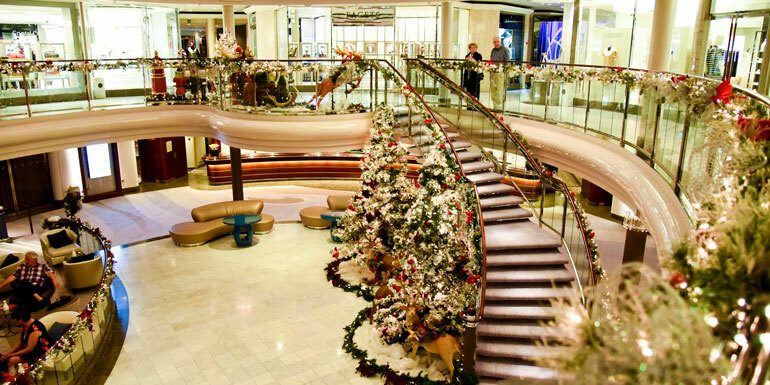 Holiday décor abounds with cruise ships transforming into floating festive beauties, starting with majestic Christmas trees. You’ll find plenty of wreaths, holly, mistletoe, and you might even see a waiter or two wearing Santa hats on Princess Cruises’ ships. Crystal Cruises’ two ships boast more than $100,000 in decorations that range from Victorian to modern to celebrate Thanksgiving, Hanukkah, Christmas and New Year’s. On Cunard, guests sailing in the top Queens Grill accommodation on Christmas are contacted by Guests Services prior to their voyage to see if they want their own Christmas tree set up in their suite. Uniworld Boutique River Cruise Collection places small Christmas Stars in all guest suites. Hanukkah menorahs are part of the décor on numerous ships, including on MSC Divina and Holland America Line, Seabourn and Princess’ ships. Traditional holiday meals and special menus—for Christmas, Hanukkah and New Year’s Eve—make anywhere in the world you sail a little bit like home. On Christmas Eve, Costa Cruises’ guests enjoy a seven-course Christmas Eve dinner in the main dining rooms featuring seasonal Italian specialties, such as the traditional Italian dessert popular during the holiday season, sliced pandoro or “golden cake,” and dried fruits. Torroncino, or Italian nougat, is available in the bars and lounges. On Christmas day, guests are served a five-course Christmas Lunch. Celebrity Chef Carlo Cracco has been enlisted to create a special Christmas menu onboard MSC Divina. Roast turkey or goose are part of the traditional favorites on Princess, as well as specialty items like potato latkes, matzo ball soup, gefilte fish and matzo during the holiday to commemorate Hanukkah. 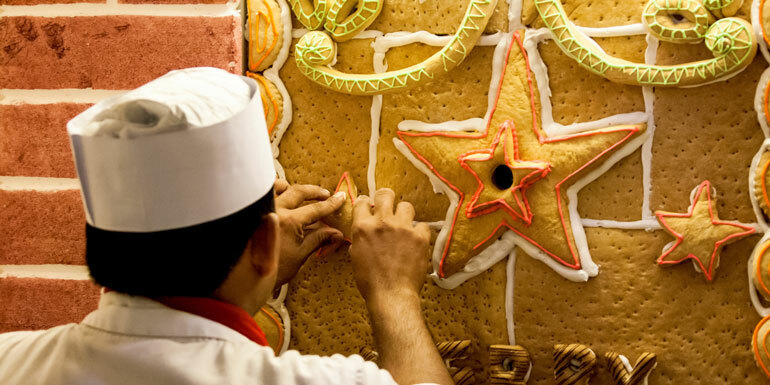 Gingerbread houses and villages can be seen on many of the ships, with Seabourn featuring a gingerbread house, Christmas chocolates, a chocolate Santa Claus, fresh Christmas cookies, candy canes, dried fruits and fresh clementines at The Restaurant’s entries. On Christmas Eve, a special Christmas basket or plate containing the same selection of goodies is delivered to each suite at turndown. SeaDream Yacht Club not only serves a traditional dinner, but also offers a variety of other Christmas related food items such as mince pie, Christmas pudding, gingerbread crisp, mulled wine, gold chocolate coins and eggnog. One gingerbread house is Bethlehem themed on SeaDream I, and a Paris themed gingerbread house with the Eiffel Tower is on SeaDream II. 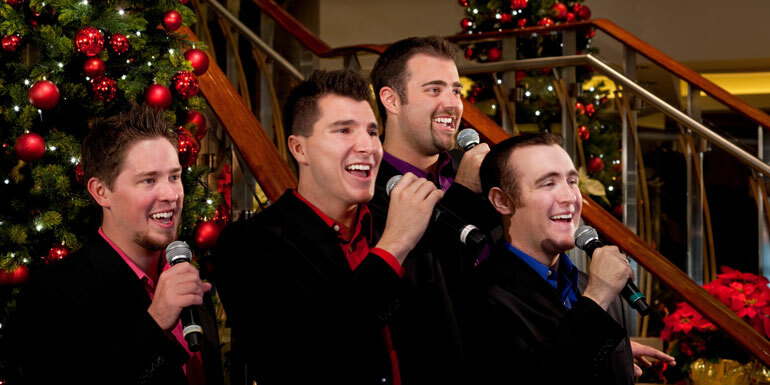 Caroling, special holiday entertainment, holiday themed movies and shows keep the mood festive throughout holiday cruises. Holland America also features Holiday Karaoke and Holiday Party Planner crafts such as Christmas cards, and Christmas themed cooking demos. Holiday music will even be available in the in-room music systems, as well as part of the live entertainment on Carnival Cruise Line’s ships. New Year’s Eve has its own set of festive excitement from prepping for New Year’s Eve by making your own party hats and noise makers on Crystal and enjoying specialty cocktails on Norwegian Cruise Line to a countdown and balloon drop on Holland America and Celebrity Cruises and caviar and champagne party on Windstar Cruises. 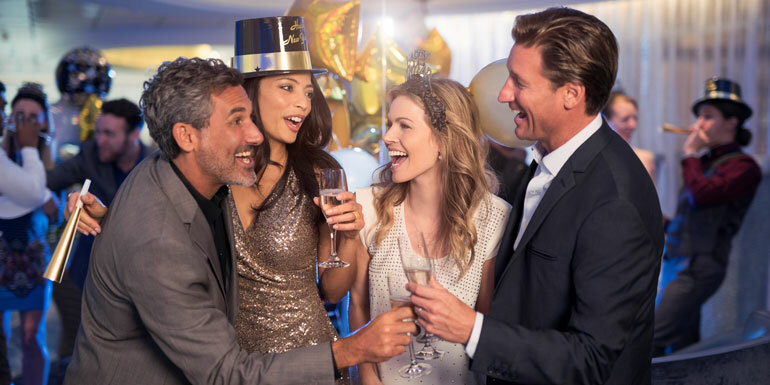 Football fever takes over on New Year’s Day with telecasts (if available) in shipboard lounges on such lines as Princess and Holland America. 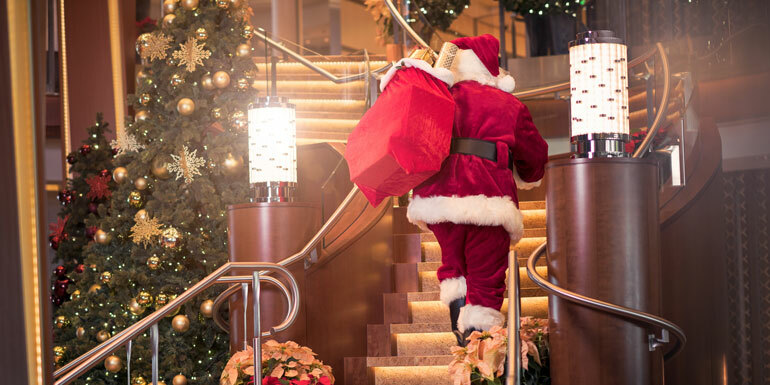 Santa Claus comes bearing gifts for the youngest cruisers on many of the ships. Holland America also has a special Breakfast with Santa. On Costa, Santa visits and brings panettone (sweet bread loaf) and a gift to be delivered to cabins for all the children onboard. He will also have a special present for the cruiser who writes him the best letter. 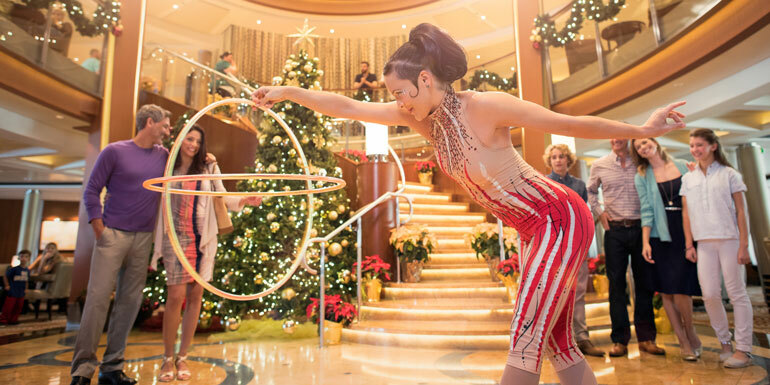 Throughout the holiday voyages, kids and teens can also enjoy such activities as their own New Year’s Eve parties on Crystal, a Fun Factory Holiday Carnival on Celebrity, and the chance to make ornaments for the ship’s Christmas tree and perform in a holiday play on Princess. Carnival Cruise Line’s special holiday show includes a performance by the children from the onboard youth programs which is sure to bring down the house. Kids on Royal Caribbean International’s ships featuring the DreamWorks Experience can take holiday photos with favorite characters in holiday outfits from Kung Fu Panda, Shrek and Madagascar and enjoy a special holiday character breakfast. 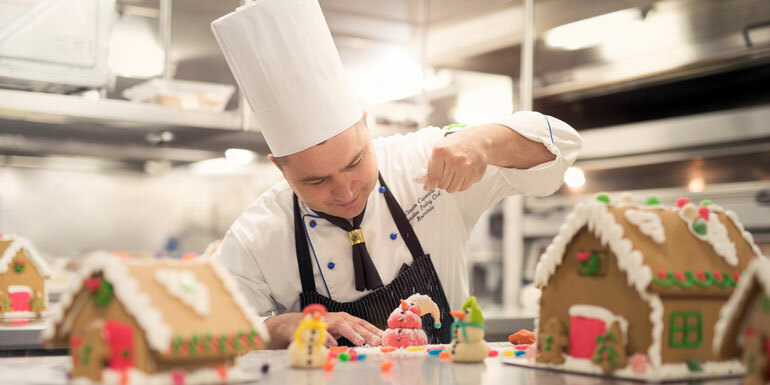 Family arts and crafts and cookie decorating, and even holiday ice skating aboard select ships are also part of Royal Caribbean’s holidays for the youngest cruisers and their parents. Have you ever cruised during the holidays?